Dragon Age RPG Set 1 was enthusiastically received. Old hands and new tabletop roleplayers leapt at the chance to tell exciting stories of their own in the perilous and compelling world of Thedas. Dragon Age RPG Set 2 got delayed but, following a robust and open playtest process, was released to great appreciation by fans and newcomers alike. 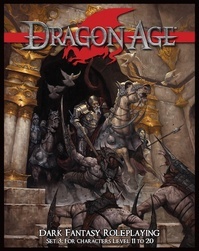 We at Green Ronin once planned to release two additional sets, that would together cover character levels 11-20, but due to further delays on our end and a desire to get the whole game in front of fans and players sooner, we combined what would have been Set 3 and Set 4 into a single set: Dragon Age RPG Set 3. Alas, Set 3 isn’t ready for publication yet. We know many of you are eager to take your characters and adventures beyond level 10. We are, too. If we could publish Set 3 tomorrow, we’d do it. Because we can’t, because it’s not ready, we’re repeating what we did for Set 2 and stress testing this new set by getting your input on it. This is our open public beta test of many of the game-mechanical aspects of Set 3, including rules for advancing Player Characters all the way to level 20! We hope to use stunt points to strike two birds with this stone, giving Dragon Age RPG fans the chance to resume their campaigns right away while also strengthening the Set 3 rules with playtest notes devised by your sharp eyes and cunning. Here, then, is the Set 3 open beta package. Inside you’ll find an assortment of new components for the Dragon Age RPG, from talents to specializations, from spells to monsters. This all represents a sizable portion of the Set 3 manuscript—but still only a portion. Features such as our full-length adventure and our many pages of background lore are not contained in this playtest package. A few components, still on our workbenches for development, are also not here. So don’t fret if you something you were looking forward to in Set 3 isn’t in here—we’ve got a few surprises in store. Inside you’ll also find text at various type sizes and adorned with manuscript tags and layout notes. This is a manuscript in flux, a molten thing. We’ll get it tightened up while you’re playing. Remember, please, that only playtest responses emailed to the address in the package, with signed release forms, can be considered. We can’t count forum posts, blog posts, tweets, or similar messages as official playtest feedback. We’d appreciate it if you sent your serious critiques to us directly and remember that this is a work in progress.